Vehicle is 1983 300CD Turbo. Neither the stop on my vacuum transmission modulator valve nor the full load stop on my IP are being hit when I jack the throttle linkage all the way down, simulating full pedal pressure. I have not adjusted either my full load stop or my throttle linkage, so this is somewhat of a mystery to me. I'm not sure exactly which parts of the throttle linkage need adjusting here and how much; does anyone have experience adjusting to fix this problem? (let me be clear that the full load stop on the IP doesn't need adjusting, nor does the transmission vacuum modulator, but the throttle linkage, which is somehow not able to be fully engaged when the pedal is fully engaged). The pictures below exhibit the slight gap between the part of my throttle linkage that should be hitting my full load stop and the part which should be hitting the stop on the vacuum modulator. "I would rather be ashes than dust! than it should be stifled by dryrot. I shall use my time." The stop lever is still functional, and the acceleration is fine, but I'd like to at least have the option to run the car at full load, rather than being restricted by a maladjusted throttle linikage. 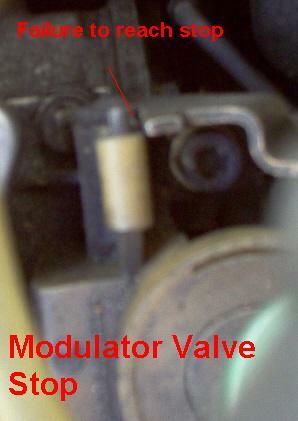 Location: Bay Area No Calif.
RE: The second pic, showing stop lever near transmission vac modulator. The gap is supposed to be 0.5 mm. Not closed. Before you set out to adjust the levers by loosening the locknut and rotating the linkage sockets in and out to change lengths, measure the linkages carefully and make a sketch of them, then when things are worse after changing them, you can get back to factory setup. 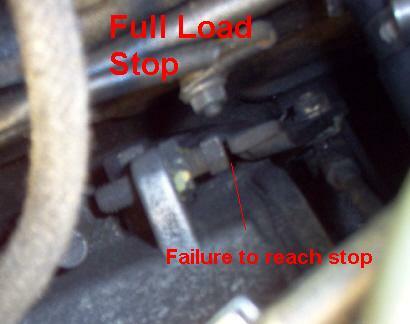 I have seldom found any engine performance increase from changing the gap at the stop lever. Sometimes the idle speed is increased after messing with the linkages, and the transmission shift points can be changed also, so do a careful road evaluation as you go with this kind of thing. But watch out that server is SLOW! '00 E320 (wifes car), '95 E320 Wagon my favorite road car. '99 E300D wolf in sheeps body, '87 300D Sportline suspension, '79 300TD w/ 617.952 engine at 367,750 and counting! There is a fix for this problem that doesn't even require tools! The problem isn't necessarily an adjustment, at least in the conventional sense. Simply grab the entire pivot mechanism on the side of the V/C and pull/push it slightly towards the rear of the car. As you bend it (even slightly) in that direction the angle of the linkages will change slightly favoring WOT. Shouldn't take more that a few mm of "bend" to get you to the full load stop, nothing drastic. Given that the metal there is somewhat "springy" I usually keep progessivly applying pressure and then checking until I get it to the full load stop. I've literally gotten hundreds of 617s to the full load stop like this and never once loosened any locknuts to make adjustments to the linkages. I think this may be it, because after messing around with the linkage some more, and fully engaging it from different points on the linkage, I found that sometimes it hit the full load stop, and sometimes not. If it was simply adjusted incorrectly, then all trials would be the same. Thanks for the advice.